Japanese people love eating eggs in many ways. One of the most popular uses for the egg is to make a very thin omelette called usuyaki tamago (literally, thinly cooked egg). Usuyaki tamago is used julienned as a garnish, or as a wrapper for sushi rice and other things. Beat the egg and water or dashi together. Add the sugar and salt and beat until dissolved. The cornstarch is optional, but it does add some more strength and stability fo the thin egg. 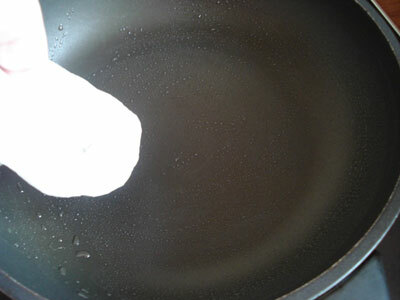 You may want to use cornstarch when you are making usuyakitamago for wrapping something in. 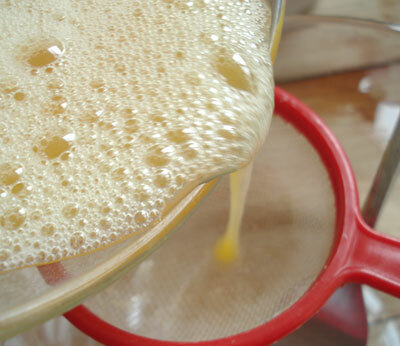 To ensure a very smooth egg batter, strain the beaten egg mixture through a sieve or a large-mesh tea strainer. Heat up a nonstick frying pan over a low-medium heat and coat with a little oil: Pour some into the pan, then use a paper towel to spread it around and wipe up any excess oil. 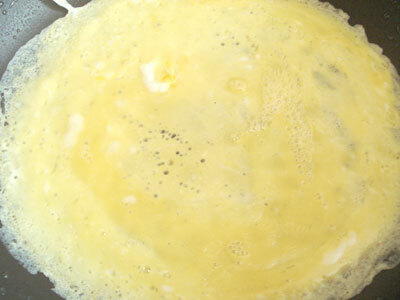 Add a little of the egg mixture (ho much depends on the size of your frying pan, but for a small 18cm/6 inch pan allow about 1/8th cup) and rapidly swirl it around until it just coats the bottom. Cook on low heat just until the egg is set - this should only take a minute or so. It's done when the edges are dry and the top is just about cooked. 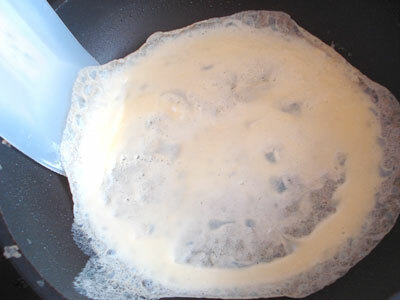 Loosen up the edges with a spatula, then flip the pan upside down onto a plate - the omelette should flop out, like a crepe. Let cool. You should get about 3 usuyaki tamago per egg. 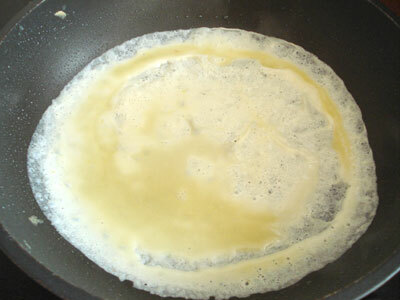 If you find the pan is getting too hot and the egg is browning too much, cool off the pan by pressing it lightly on a folded moistened kitchen towel. 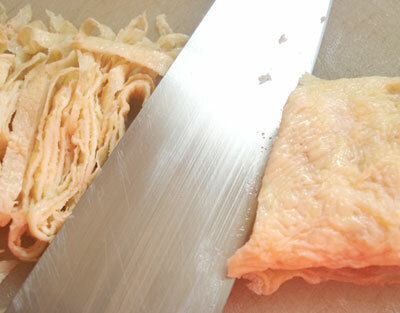 To use as garnish, fold 1 or 2 usuyaki tamago over into thirds, and cut into thin strips or julienne with a sharp knife. This is called kinshi tamago (錦糸卵）, scattered on the top of sushi, noodles, and so on. You can also use the whole usuyaki tamago as a wrapping - the bright yellow color makes anything very pretty. 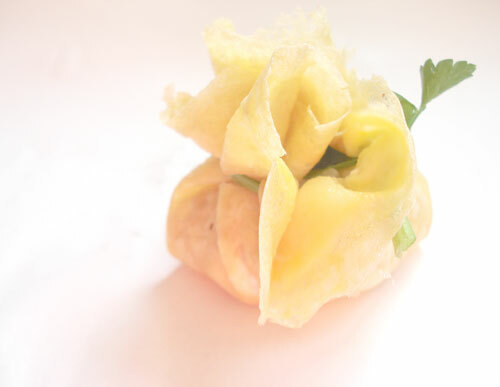 An easy way is to just fold it into quarters, as for these shell shaped sushi. A slightly more tricky way is to wrap a filling (such as some flavored sushi rice or a small onigiri) in a beggar's purse shape. Here I have used a blanched parsley stalk as the tie. This wrapping shape is called chakin; sushi in this shape is called chakin zushi. For this and other wrapping methods, the more stable version of usuyaki tamago with some cornstarch in the egg mixture is recommended. Submitted by maki on 2003-12-13 14:49. Linked to this recepy from our main page, hopefully a lot of Icelanders will be cooking this through the dark winter months! My mother used to make onigiri for us when I was little and she liked to use a thin kind of omelette, like this. I've been trying to get it right for years and only NOW has it worked! She could make them but has never been very good at showing or telling me how to cook things (everything I know I learned from Grandmother or taught myself). This is so cool! I'm trying to make a bento, and how much suger do you need to make a sweet omlette? Sooo cute! Looks yummy too! I just made this the other day, but didn't season the eggs or add cornstarch. I will try that next time. Can you wrap onigiri with this? How does that work? On a separate note, I'm very interested in learning about Japanese traditional breakfasts. What is a typical breakfast at home like? Sure, you can wrap an onigiri in it, though it will not 'stick' to the onigiri. 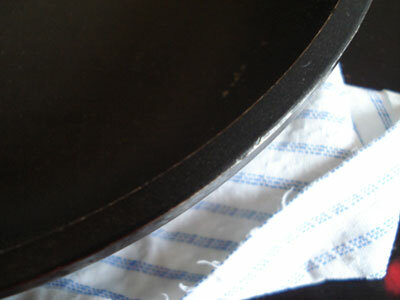 You can just wrap the usuyaki tamago gently around it, or make a bag like I showed. I tried it for breakfast and it was delish. I want to try eating Japanese breakfast more often. It will be interesting to see how my body responds to eating a nice full meal in the morning. Thank you for all your fabulous tips! love your blog! I LOVE your blog. I was just wondering... can you freeze these OK? 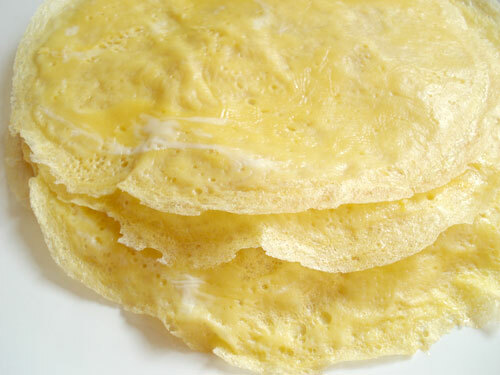 I am never sure about freezing egg..
You can try freezing them, but they may get a bit spongy in texture (unlike crepes...probably because it's mostly egg, and egg does change texture in an unpleasant way on its own). Arigato,this is really quick and easy to do in the morning. I love the purse. My daughter claims to dislike eggs so I "hide" them in foods I make for her. I'm wondering if the usuyaki tamago wrapping in PLAIN VIEW would be too cute for her to resist or even notice that it's an egg! Thank you for so much information on this site. I LOVE it. I heard you can use these for a sushi wrap...how do you do that?